New album by the San Franciscan AOR heroes. If I'm honest I was a bit nonplussed by 'Hole In The Sun', the previous album by San Franciscan AOR heroes Night Ranger. Even the similarly modern sounding 'Neverland' and 'Seven' had a smattering of classy songs with the trademark twin guitar work of Brad Gillis and Jeff Watson well to the fore, but despite the fact that the four main Rangers were all on board, (bassist/vocalist Jack Blades and drummer/vocalist Kelly Keagy being the others), 'Hole...' seemed to lack any of their recognisable trademarks. Thankfully 'Somewhere In California' sees the equilibrium restored, successfully mixing the fresh and contemporary sound that the band obviously crave, with the classic Night Ranger that the label probably wanted all along. Watson has since left the band, to be replaced by Keagy's Skrap Metal band mate Joel Hoekstra, while keyboardist Eric Levy has replaced Christian Cullen. Opener 'Growin' Up In California' is very much a statement of intent, being basically a hard rocking modern re-write of '(You Can Still) Rock In America', complete with the same keyboard part and some incendiary playing from Gillis and Hoekstra. It's also a little rawer and rougher round the edges, which gives the impression of a Night Ranger/Damn Yankees crossover, but that's not necessarily a bad thing. There are traditional NR tracks in the catchy and melodic 'Bye Bye Baby (Not Tonight)', the upbeat closer 'Say It With Love' and the infectious guitar parts of 'It's Not Over', each one lodging itself in your brain after the first listen, whilst the typical ballad 'Time Of Our Lives' is the only really low-key track on offer. Elsewhere 'No Time To Lose Ya' and 'Rock 'N' Roll Tonite' are simple guitar-based rockers with hints of UFO and Aerosmith respectively, and 'Live For Today' sounds like Night Ranger meets Enuff Z'Nuff with its psychedelic overtones. Other highlights are 'Follow Your Heart', which despite the pompy bits and flashy guitar arpeggios, is a very accessible song with extended twin guitar solos, and the superbly commercial 'End Of The Day' has concise guitar flurries and great vocal melodies, whilst the contemporary rocker 'Lay It On Me' tempers it's modern instrumentation with a 'Whoa-oh' chorus. Judged against their latter day output it seems that quite a bit of compromise has gone on with 'Somewhere In California', the album coming across as a mixture of 'Seven Wishes', 'Man In Motion' and 'Seven'. It's one of their most hard rocking albums to date and the melodic vocals of Jack Blades and Kelly Keagy, the flashy guitar work and the infectious choruses all make a very welcome return, but it's to their credit that they seem to have achieved it without losing their contemporary edge. In an age where many bands of their ilk are again making strong albums, Night Ranger have come up with one of the very best. Iconic AORsters Night Ranger return with a new album in their 30th anniversary year! Featuring founder members Jack Blades on bass & vocals, Kelly Keagy on Drums & Vocals, Brad Gillis on lead and rhythm guitar as well as new boys Joel Hoekstra lead & rhythm guitar & Eric Levy on Keyboards. 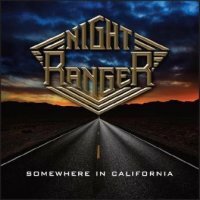 There is quite a buzz about this new one from Night Ranger, whilst I think this is a great album and will surely be in many people’s lists of best of 2011 albums, I fear it’s not the classic the buzz indicates. What you do get here is a solid collection of melodic beauty’s that has the Night Ranger stamp all over it and should be enjoyed for what it is and add a few more unforgettable Ranger tunes to the collection. Let your own ears decide on this one, but I’m confident AOR lovers will relish every second of music on offer on “Somewhere in California”. This album is far more accessible than the bands previous effort “Hole In The Sun”, which disappointed and didn’t linger in the memory for long. So this album is really a return to form and could be their best since their 80’s heyday. They have embraced a more modern pop rock feel to their sound but still retain all those AOR traits they are known for – this is AOR for the next Generation, I doubt people will bemoan this album as a throwback to the 80’s. The musicianship on offer here is outstanding with stellar vocal performances, hook filled guitar work and important keyboard work which enhances every song whether it be subtlety or upfront. It’s the standard of these performances which put the band head and shoulders above all those around them. Opener “Growin’ Up In California” is a summer tune extraordinaire! The track does have a modern pop rock ambience but really evokes memories of the wonderful melodies of the Beach Boys and that era’s California surfing’ rock and roll sound! The bands first single from the album and it’s easy to hear why, full of hook laden keyboards and guitar licks. “Lay It On Me” has crunching guitars and pounding drums, a song with real drive and a sing-along chorus. It's a song that’s full of AOR style swagger and packs a mean melodic punch. “Bye Bye Baby (Not Tonight)” opens with a phenomenal guitar solo which does repeat throughout the song and trust me you’ll never get it out your head and you will don guitar to try and recreate it. This song makes a real impression and contains some fantastic vocal melodies as well as some lovely understated keyboard work. This song probably contains my favourite guitar solo on the entire album. “Follow Your Heart” has a retro 70’s AOR feel to it, I have to admit the song didn’t really stick out for me and felt like a bit of filler and didn’t have the impact the other songs were having. Solitary ballad “Time Of Our Lives” is an outstanding tune, a highly memorable and powerful song. Some insanely good keyboard work from Eric Levy on this one, not only does he create some touching melodies throughout but his keys on the chorus are top notch and enhance it tenfold. You’ll never forget the chorus it is pure melodic bliss and if it was covered by a pop band I’d say it’s a sure fire number one hit! “No Time To Lose” contains some great swaggering riffs and see’s Night Ranger in full on rocker mode. With a HUGE chorus that other bands would kill for and Keyboard’s to die for! “Live For Today” is another retro rocker and it’s another fluff piece which loses me unfortunately. “It’s Not Over” opens with some insistent guitar work and has a real old school Night Ranger vibe, especially on the harmony laden chorus. “End Of The Day” has some unforgettable, instant and catchy guitar riffs. It’s a head banging melodic rocking beast of a song with a huge harmonious and soaring chorus. I’m sure this will be many fans’ favourite. “Rock N Roll Tonite” does exactly what it says on the tin, a full on rocking’ melodic anthem. A song that’s full of energy and punk edged attitude. “Say It With Love” closes the album with a bang. It’s a good way to end a fantastic album with some memorable guitar work and a pure Night Ranger 80’s AOR chorus. There is some wonderful hook filled vocal harmonies that litter the verses and is a track full of drive and hooks – AOR genius that will stick in your head! Night Ranger are probably most famous for their ballads, but this album is a full on hard rock journey and far from the soppy power ballads that were the bands hits back in the day, proving they aren’t a lightweight band with a huge rebel roar here. With the AOR scene been so unfashionable and seen by many as cheesy a good record from a major name can be a real boost in the arm for the scene and its credibility, “Somewhere In California” proves AOR isn’t dead and is still a musically relevant style in no uncertain terms. From my point of view this has to be a must buy release for all fans of AOR, whom I’m certain will love this album with vigour. Now if we can only get these guys to do a full UK tour! Hang on what’s that in the sky? Is that a plane? Is it superman? No it’s a pig!!! !